By the end of the fifteenth century, the beauty and creativity of Italy are matched by its brutality and corruption, nowhere more than in Rome and inside the Church. When Cardinal Rodrigo Borgia buys his way into the papacy as Alexander VI, he is defined not just by his wealth or his passionate love for illegitimate children but by his blood: He is a Spanish Pope in a city of Italians. If the Borgias are to triumph, this charismatic, consummate politician with a huge appetite for life, women, and power must use papacy and family--in particular his eldest son, Cesare, and his daughter Lucrezia--in order to succeed. Cesare, with a dazzlingly cold intelligence and an even colder soul, is Rodrigo's greatest--though increasingly unstable--weapon. Later immortalized in Machiavelli's The Prince, he provides the energy and the muscle. Lucrezia, beloved by both men, is the prime dynastic tool. Twelve years old when the novel opens, she embarks on a journey through three marriages, from childish innocence to painful experience, from pawn to political player. I am a huge fan of the historical novels by Sarah Dunant and could not wait to get my hands on this one. I was not disappointed. 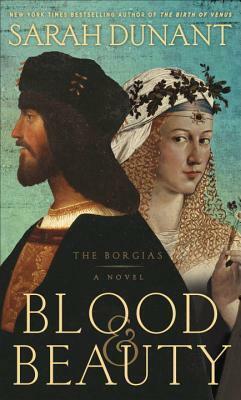 As indicated in the summary, this book centers around 3 main characters--Pope Alexander (Rodrigo Borgia) and two of his illegitimate children, Cesare and Lucrezia. Alexander was surprisingly likable--yes, he was devious and ambitious, but he also had a sort of childlike joie de vivre. In my minds eye, I could see him just charmed and gleeful in various parts of the book. Cesare, the Prince of The Prince, is nothing short of a sociopath. If ever a book had a villain, Cesare is that villain for Blood and Beauty. I will say, though, that he isn't your typical villain--he has his moments of where some semblance of humanity shows through, especially when it concerns Lucrezia. Lucrezia was my favorite character. She was probably the most fictionalized of the three, simply because there are fewer accounts of her historical character. She starts out as a twelve-year-old, a very young twelve-year-old. She is used mercilessly by her family and, somehow, emerges as a strong woman who instead of being resigned to her fate decides to design her own. (Lucrezia apparently had quite a life after the point in history where Blood and Beauty ends). There were things that I found surprisingly interesting about this book. The first is the acceptance of the pope's illegitimate children. There is a comment in the book early on--and I can't find it now to quote it--where there is a line drawn between celibacy and chastity. This line is nearly invisible in 21st century terms, so I can only assume that line was a bit more defined in 15th-16th century terms. Another aspect that I found interesting was that, despite all his political ambitions and scheming, Alexander was also quite religious. I guess that shouldn't be too surprising, given that he was the Pope, but it does seem that popes and cardinals in that time period tend to be portrayed as being far more concerned with the matters of men than the matters of God. All in all, this was an satisfying and enjoyable read for me. I will admit that it is not my favorite of Dunant's historical novels, but that is more a matter of preference. The scope of this book is far wider than those of her other books, which tend to be focused more on one character. There is, of course, nothing wrong with that--I just prefer the more focused plots. Yet, if anyone asked me for a recommendation for a Renaissance historical novel, this would be on my list.